The Central Committee of the Vietnam Red Cross Association in co-ordination with the People’s Committee of Dak Nong province yesterday launched ‘an action month for Agent Orange (AO) victims’ from August 10 to September 10, 2009. Addressing the launching ceremony, Doan Van Thai, Vice President and General Secretary of the Vietnam Red Cross Association, stressed that although the war ended 34 years ago, it has left very severe consequences. Currently, there are three million dioxin/AO victims nationwide, including around 150,000 children with inborn deformities. Many victims belong to the child or grandchildren generations of those who were directly exposed to AO. In recent years, especially since 2004, through movements called ‘Tet (lunar New Year) for poor people and AO victims’ and ‘Action month for AO victims’ and etc, the red cross associations at all levels nationwide, through the Fund for Sponsoring Vietnamese AO victims have assisted hundreds of thousands of AO victims so that they could gradually overcome the difficulties in their lives, he said. However, most of the AO victims are still facing many difficulties in their lives and need the community’s care and assistance, he added, emphasising that for this reason, in the action month for the AO victims this year, the Central Committee of the Vietnam Red Cross Association calls on branches, unions, enterprises, benefactors, charity organisations and people nationwide to organise practical activities such as supporting the funds for sponsoring AO victims at all level; visiting and presenting gifts and sponsoring and providing monthly allowances for the families of AO victims; best implementing the campaign called ‘Each organisation, each individual is coupled with a humanitarian address’ with the aim of sharing and helping the families of AO victims overcome their difficulties and integrate the community. 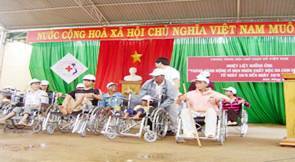 At the ceremony, the Central Committee of the Red Cross Association presented 55 gifts worth VND 300,000 – 500,000 each to the AO victims in difficulties in Dak Nong province and 50 wheelchairs. The Dak Nong provincial Red Cross Association awarded 96 gifts worth VND 200,000 – 500,000 each to AO victims and assisted 15 families of the AO victims in Dak Rlap and Tuy Duc districts with the funds raised from the project of helping AO victims in 2009 so that they can develop production and do small trade. On this occasion, representatives of many agencies and enterprises at home and abroad visited and presented gifts to AO victims in Dak Nong province and provided VND 550 million support for the provincial Fund for Sponsoring AO Victims.